It is important to note, the Moon is still in Sagittarius, and the Sun is currently in Aries. Venus, the goddess of love, enters Pisces today, its sign of exaltation. We are on the lead up to a sextile which will occur tomorrow between Venus and Uranus, which, I feel will be felt today with Sagittarius giving a push toward being adventurous, and Aries, just well, pushing. 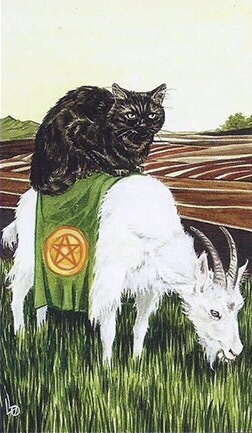 There are those who will still be able to live within the constraints exemplified by the Knight of Pentacles, but, on the flip side, there will be those who tell Mercury Retrograde to bugger off, and take that chance on that first date, or new job, thus throwing caution to the wind. It can be a sudden move which can ultimately pay off for you, but will still likely require some form of reassessment down the line, even if successful. This entry was posted in Card of the Day, General Tarot, Readings, YouTube Videos and tagged Card of the Day, Guidance, Knight of Pentacles, Path, Reading, Tarot. THE CARD’S STORY BY: KEN MEYER JR. When I started to search for a myth that struck me, I thought it was going to be an uphill battle. 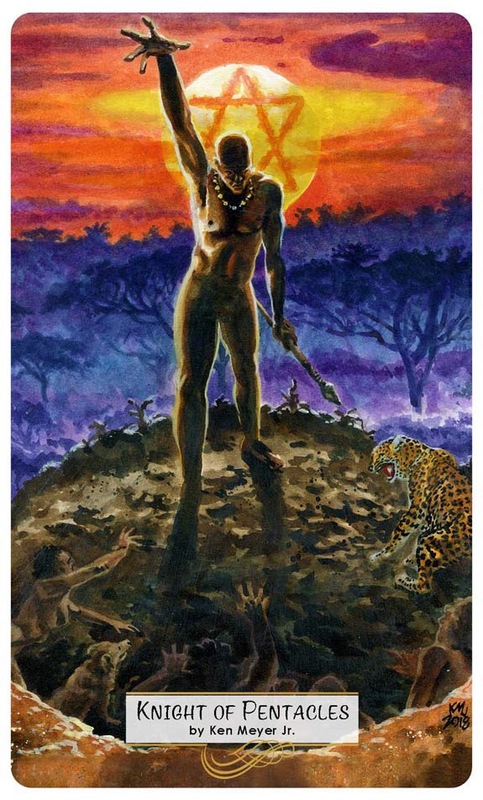 But, I got very lucky when I came upon the African Akan world building myth of Adu Ogyinae, first man to emerge to the surface of the earth. It also said that all humans used to live deep underground, until one day, seven men, five women, a dog and leopard crawled up through a huge hole left by a giant worm. The fact that he was the leader and organizer worked for the card. And it also gave me a good visual place to start from. Adu Ogyinae stands above ground for the first time in his life. He’s made it. It was a slow, arduous task, leading and coaxing his people to the surface, but it was worth it. Now he and his people can live in the warmth of the sun, enjoying a new life. This is not a time to let yourself be distracted, or procrastinate any longer. Crunch time is here, and you need to get it done. So knuckle down and finish the job. Put away your phone, shut down social media, and really dig into the task at hand. No, it’s not always fun or glamorous, but it will be worth it – you are responsible for your own success, no one is just going to hand it to you! The Knight of Pentacles can represent a dedicated, responsible person in your life at currently – someone who never gives up. A bit of a perfectionist, this person gets everything done, taking pride in completing each and every task. Adu Ogyinae is a character in Akan mythology, responsible for guiding his people out of the earth, where they could begin a life on the surface. According to the legend, humans lived underground, until one day, Adu Ogyinae lead his tribe out through a tunnel left by a burrowing monstrous worm. He was a responsible out-rider who became their leader, organising them and protecting till his death. Th e chivalrous, reliable, nature of this fi gure makes him an appropriate Knight. 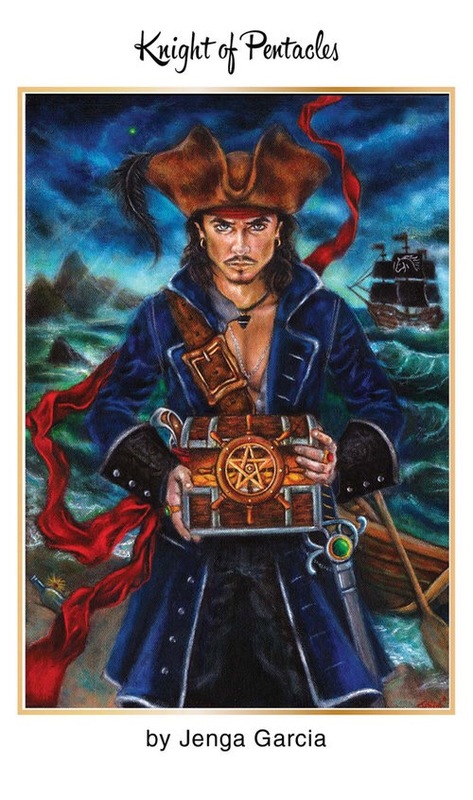 This entry was posted in Artist, Deck Review, Featured Card of the Day, General Tarot, Readings and tagged 78 Tarot, Artist, Guidance, Knight of Pentacles, Mythical, Path, Reading, Tarot. Pretty much how this card translates for you today is dependent upon the attitude you wake up with on Monday morning. Taurus can be a hard worker with a fabulous reputation, or not. It is also possible under this Moon to be a bit of a slacker, which may not go over well with coworkers if they feel you are not pulling your weight. For the most part, I feel you can put this card and the energy of today’s Taurus Moon to good use, earning you the title of Mr./Mrs/Ms. Reliable. As in the fable of the tortoise and the hare…slow and steady wins the race. I think you get the idea, so the question is whether or not these are qualities to which you aspire today, or someone in your midst with whom you are dealing. I would like to think it is you, and that you are taking an approach to your life which allows you to do the job right the first time, and that does not necessarily mean on the job, rather it can apply to any area where you are trying to accomplish something. For this card, I always seem to mention the timeless fable of the ‘Tortoise and the Hare’, bringing to mind that slow and steady wins the race. This entry was posted in Artist, Card of the Day, General Tarot, Love and Finance, Patreon, Readings, YouTube Videos and tagged Card of the Day, Guidance, Knight of Pentacles, Mythical, Path, Reading, Tarot.